Visit Resume Edge online at ResumeEdge.com for a hand-picked team of Resume Writers specializing in 40 different industries to provide the highest quality resume and cover letter services available. ResumeEdge provides a variety of professional resume services that can help you land your dream job. Resume Edge's writing and editing experts have worked for leading companies such as: AT&T, The Federal Reserve, General Dynamics, HBO, J&J, Kodak, Lockheed Martin, Mobil, Pfizer, SCB, and many more. 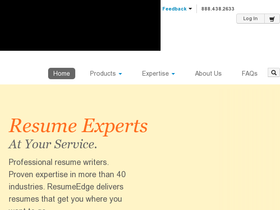 ResumeEdge is the leading provider of Resume Writing Services online and the chosen resume partner of Yahoo! HotJobs, CareerJournal, and Dice.com. Save on your next purchase from ResumeEdge.com with Resume Edge discounts, Resume Edge coupons and Resume Edge savings from 58coupons.com. Save $10 off orders over $150 with purchase at Resume Edge. Click code to view. Receive $5 off a purchase of $150 or more at ResumeEdge. Click code to view. ResumeEdge.com is offering their Resume Builder for 25% off. Get started by clicking the link.